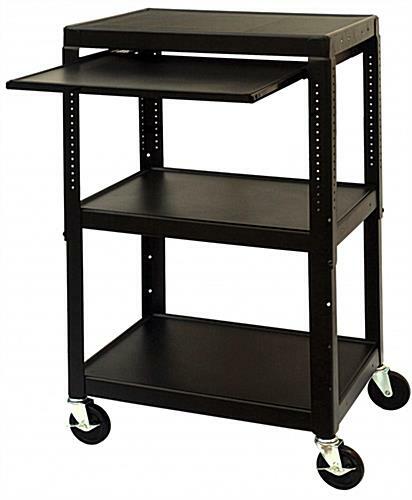 This Overhead Projector Cart is a Mobile Shelf Unit. This Display is In Stock Now! This Overhead Projector Cart Includes Rolling Wheels. Includes (4)- 4" caster wheels with two locking for a mobile display that can be locked into place. Pull out shelf that can be used from the front or back of the cart, and hidden underneath when not in use. Mat made of neoprene for top shelf to prevent sliding of equipment. 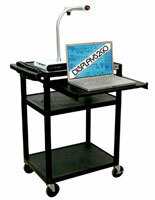 This overhead projector cart that includes an optional handle is great for classroom use. This presentation furniture allows teachers to use the pull out shelf for a laptop which can be hidden away when not in use. This rolling multimedia trolley, overhead projector cart that has a pull out shelf is powder coated black for a sleek finish. These adjustable shelving trolleys include a mat to keep equipment in place. This steel overhead projector cart is simple to roll around a space making it versatile and useable in many rooms of a building. 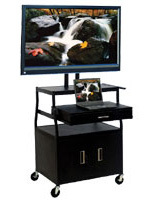 This presentation trolley has an adjustable height ranging from 26"h to 42"h depending on the purchasers need. This overhead projector cart ships unassembled to save on costs. The easy to follow instructions are included with the unit. This overhead projector cart is great for establishments that want to utilize a highly mobile stand. 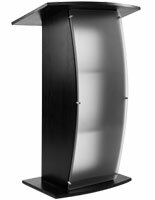 This pulpit is a great platform for presentation items. This overhead projector cart can be used to keep classroom equipment out of the way. This display has ample shelf space. This black finish overhead projector cart, also known as a media trolley, can fit into nearly any décor. 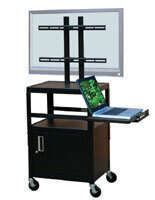 This AV trolley, classroom furniture has a mat included for the top shelf to keep equipment in place. This overhead projector cart that has 4" rolling wheels is simple to move around a space. This multimedia trolley comes with a UL listed 15' cord with 4 outlets. This presentation furniture is durable and meant for long use! These displays are functional and versatile to meet all of your presentation needs. These rolling workstations have 4 wheels, two of which lock. Manufacturer model# FSC4226E.